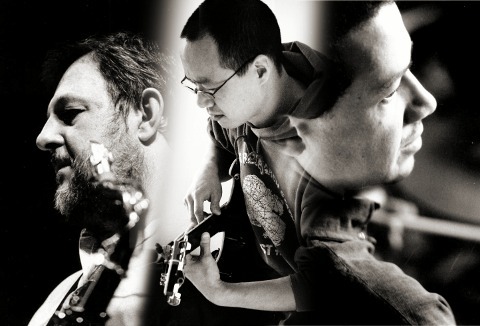 Tuesday, February 15, 2011, at 9:00pm: Performance by Paul Dunmall (saxophones), Han-earl Park (guitar) and Mark Sanders (drums) presented by Fizzle. The event takes place at The Lamp Tavern (Barford Street, Birmingham B5, England). Admission is £5. Improviser, guitarist and constructor Han-earl Park (박한얼) works from/within/around traditions of fuzzily idiomatic, on occasion experimental, mostly open improvised musics, sometimes engineering theater, sometimes inventing ritual. He feels the gravitational pull of collaborative, multi-authored contexts, and has performed in clubs, theaters, art galleries and concert halls in Europe and America. He is involved in collaborations with Bruce Coates, Franziska Schroeder, Alex Fiennes and Murray Campbell, and is part of Mathilde 253 with Charles Hayward and Ian Smith. Recent performances include Mathilde 253 with Lol Coxhill; duo concerts with Paul Dunmall, and with Richard Barrett; trios with Matana Roberts and Mark Sanders, with Kato Hideki and Katie O’Looney, and with Thomas Buckner and Jesse Ronneau; as part of the Evan Parker led 20-piece improvising ensemble; and the performance of Pauline Oliveros’ ‘Droniphonia’ alongside the composer. His recordings have been released by labels including Slam Productions, and DUNS Limited Edition. He has appeared at festivals including Sonic Acts (Amsterdam), the Center for Experiments in Art, Information and Technology Festival (California), dialogues festival (Edinburgh), Sonorities (Belfast) and VAIN Live Art (Oxford). Park founded and curates Stet Lab, and teaches improvisation at the UCC School of Music. Mark Sanders has played with most of the UK’s major improvisers including Derek Bailey, Paul Rutherford, Barry Guy, Lol Coxhill, Phil Wachsmann, John Butcher and Keith Tippett. He has also played with Roswell Rudd (with Elton Dean’s Ninesense), Tim Berne and Ned Rothenberg (with Evan Parker), trios with Charles Gayle with Sirone and William Parker, Mark Dresser, Butch Morris’ London Skyscraper, and John Tchacai and Leo Smith with Springheel Jack playing festivals in the UK, France and Portugal. He has toured the UK and Scandinavia, and played Minnesota ‘Sur Seine’ Jazz Festival, with Peter Brötzmann; and has toured the USA and Canada, and played in Europe, Turkey and Japan, with Jah Wobble; and played in Europe USA and Canada with Evan Parker. A member of many European groups including The ZFP quartet with Carlos Zingaro/Simon Fell/Marcio Mattos which has played Ulrichsburg and Coimbra festivals and released two CDs, a trio with Frode Gjerstad and John Edwards, and a trio with Lotte Anker and Peter Friis Nielsen. Sanders is also a member of SPEEQ with Hasse Poulsen, Luc Ex and Phil Minton or Sidsel Endresen which in the last two years has played Banlieaus Bleues, Jazz D’Or, Cheltenham jazz festival, Le Mans festival, Jazz Sur L’Edre, Luz , Pori, Poitiers and Bordeaux festivals, Offside Open (new Moers), Rendevous De L’Erdre, toured through Austria Denmark and Holland and appeared on Dutch National TV.